“I guess no one wants me to relax in this job,” Levinson said Wednesday in an interview in his commission offices inside the converted Boardwalk National Bank Building, which overlooks the Atlantic Ocean. Levinson brings personal experience to the position. He was born and raised in New Jersey’s Atlantic County, worked as chief accounting officer at Resorts International, and interned at the Tropicana Atlantic City while attending Villanova University. He was chief financial officer of an architectural firm that did work for casinos in Atlantic City and New York before becoming full-time chairman of the three-member commission. At the same time, Levinson wants to promote gaming in Atlantic City. He serves on the board of the Casino Reinvestment Development Authority, which was tasked by New Jersey lawmakers to collect 1.25 percent of casino gaming revenues and invest the money in community and economic development projects in Atlantic City and the state. Since 1984, the authority has reinvested more than $1.8 billion in about 400 projects across the state. Of that, $1.5 billion has been reinvested in Atlantic City. Atlantic City’s 12 casinos have suffered since 2006, victims of the recession, declining credit markets, and gaming competition from states in the East, including New York, Pennsylvania, Maryland, Delaware and Ohio. 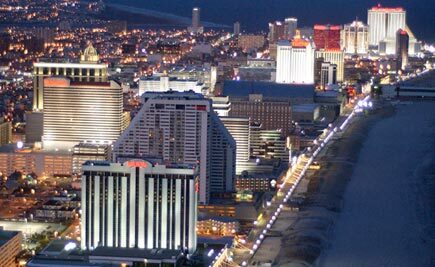 Atlantic City’s annual gaming revenues have declined more than 41 percent since 2006’s all-time high of $5.2 billion. Last year’s total of $3.05 billion was the lowest since Atlantic City casinos cracked the $3 billion mark in 1992. The market has changed in that Atlantic City no longer relies on day-trip bus gambling business from New York City and neighboring states. Instead, the city is promoting itself as a resort destination with nongaming attractions. Last year’s citywide advertising campaign didn’t even show a casino. Some of the focus on nongaming has worked. Last year, luxury tax collections in Atlantic City increased 12.6 percent to $35.5 million, sales taxes grew 10.8 percent to $61.7 million, and occupied room nights in the hotels hit a record 5.2 million. Overall, nongaming revenues grew 2.8 percent. Levinson also cited new amenities, such as The Walk, a large outdoor outlet shopping center at the base of the Atlantic City Expressway that continues to add stores, and Jimmy Buffett’s Margaritaville-themed casino, which is under construction . Levinson hopes sports wagering is eventually approved, and state regulators are pushing through regulations for Internet gaming. The first drafts are expected by Thanksgiving. “Internet gaming will happen quickly, but we want to make sure the technology is second to none,” he said. Levinson couldn’t discuss PokerStars’ potential acquisition of the Atlantic Club and MGM Resorts, because the matters are under pending investigations. He did say Atlantic City’s casinos were painted in a poor light after Superstorm Sandy. The Boardwalk’s gaming district suffered little if any damage from the storm. He blamed national news reports that showed images of the Jet Star Roller Coaster that was washed off a pier by the storm and into the ocean. That took place in Seaside, about 60 miles north of Atlantic City. Levinson said many Northeast residents thought Atlantic City and the casinos were washed away by Sandy.